The Scout seems to have replaced the 14W twin-channel version of the Westminster in 1962 or 1963. The changes between the two models were a cosmetic make-over in a larger black and cream cabinet, together with a different chassis layout (seemingly identical to later versions of the V-front Dominator, though rated 3W less). The Westminster 10W single-channel model remained in the catalogue alongside the Scout, but the Scout was a relatively short-lived model which became the Custom 15 (link) circa 1964/5, hence they are rare today. The Scout falls into the period when Watkins were changing into Wem. Some have brass Watkins logos, some have the later "day-glo" orange Wem logo, and there are unconfirmed sightings of early versions in turquoise & cream. The Westminster 14's 10" single speaker was retained, as were the two channels with two inputs per channel and individual volume and tone controls. The tremolo, with speed and depth controls, worked on one channel only. 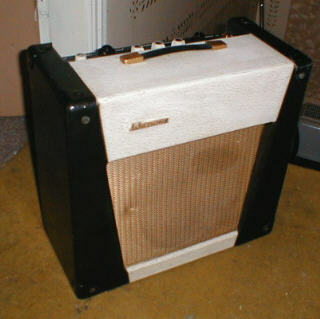 The amp was finished in black and white covering fabric, with gilt trim and a a gilt metal speaker grill.